View More In Asian Knives - Page 4. Santoku means "three virtues" in Japanese; Santoku knives are ideal for slicing, dicing and mincing. 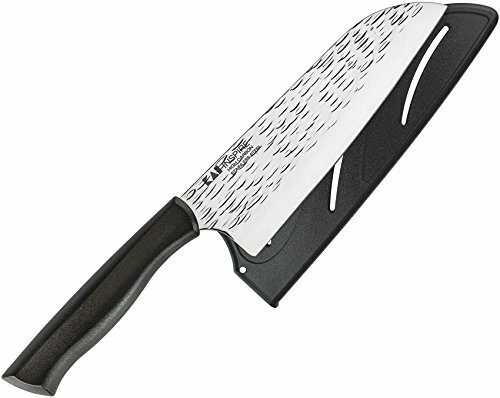 The 7-inch Kai inspire Santoku is sized pefectly for such tasks. Kai inspire cutlery is designed to inspire you to culinary heights, while providing you with the razor-sharp cutlery needed to get there. Featuring high-carbon, imported German Din1.4116 blade steel, sharpened to an ultra-sharp 16-degree cutting edge. The beautiful hammered finish helps with food release and the contoured handles provide a secure, comfortable grip. Each knife comes with a sheath for safe and easy storage. What will you create in your kitchen with inspire?